It is happening again. Last time it was a quote that stayed with me for weeks, this time it is a word. The term, “bravery”, has been whipping past me the last two weeks as if it’s driving a 1940s Triumph Roadster convertible, donning sunglasses and smiling with not a care in the world. Bravery, it seems, can come in many forms and arrive in odd and surprising ways. Sometimes bravery means following your instincts, knowing that if you don’t do it – you’ll regret it - even when there is a possibility of failure. You take the chance anyway. Holden Willard (see front page) is an example of boldly following your instinct. 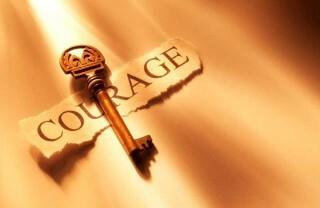 Author, Steven Kotler, describes this form of courage as “decision making in the face of uncertainty” bravery. Willard exemplifies what some, if not most of us wish we could do and be in life – to live our life doing exactly what we love, despite the ambiguity that comes with it. As a full time studio artist/painter, Holden chooses to listen to that quiet voice instead of the noisy advice of others. Although he may face a certain level of insecurity and difficulty as a result, he has the mental strength to do what he feels called to do. There is another type of bravery that comes in the form of unsuspecting circumstances such as homelessness, poverty and food insecurity. (insert Link) Kotler refers to this courage as “stamina”. Although the author focuses in on physical stamina; emotional strength and determination take the shape of bravery as well. To face the unknowns of shelter and food not only requires true grit but a level of resilience and perseverance, despite humiliation, to get to the other side. The fact is, it takes bravery and courage to live. Period. And, if you are alive and reading this, I applaud you. You are making it and deserve the most beautiful things life has to offer. And for those who are brave enough to courageously dive a little further - kudos to you. I image that when death knocks on your doors, there will be no regrets. And instead of following that light to the end of the tunnel, you may just hop into the front seat of a Triumph Roadster convertible, donning sunglasses and driving off into the sunset while waving behind you, grateful that danger, fear and difficulty isn’t what controlled your decisions or choices. That, in fact, you loved being alive.